ABOUT – Salesforce (abbreviated as SF or SFDC) is an American cloud computing company, headquartered in San Francisco, California. Mark Benioff and Parkier Harris is the founder (founded in 1999) of the company. Salesforce is a cloud-based (cloud-based means that application is delivered via the Internet and runs or compatible with any web-browser) CRM platform. CRM (Customer Relationship Management) is software that stores every detail of your customer. The details can be anything from names, address, phone#, website visit, phone calls, emails and lot more. Analyst says that Careers in Salesforce economy is growing exponentially and is believed to create 3.3 million new job vacancies by 2022. Salesforce educations have been designed as per the different job opportunities it creates in the market. These education categories depend upon the role played by an individual in the organizations. Again these educational streams demand may vary depending upon the requirements and efficient candidates. Talking of efficient candidate means multiple tasking, to illustrate this is a better way I would like to cite Develop and Tester roles. Many companies do not hire testers or to that extent, they hire a developer. They believe a developer will compensate the tester roles and responsibility if not completely than to some extent. 2. App Builder – A certified Salesforce App builder is an individual who has skills in designing and who can implement these skillsets using lightening components. 8. Specialists – The Salesforce Certified CPQ Specialist credential targets individuals having experience in utilizing the Salesforce CPQ solution. This certification confirms an individual’s expertise in building bundle configurations, pricing and generating renewals and amendments. Automation Testing – Application testing using QTP and Selenium has a great market value worldwide. Insights generation – Weekly/monthly/quarterly/half yearly and yearly tracking the inputs for better and effective insights generation. This proved to be a great analysis data with proven abilities. Salesforce is more than a CRM tool, its cloud presence and flexibility makes its demand increasing and a constant impact on the global market. According to Gartner, the overall CRM market will be around 39.5 billion USD by 2017. Salesforce is right at the top with a total contribution of more than 20% of the overall CRM industry. Careers in Salesforce demonstrate your potential in transforming companies (big or small) by witnessing real word issues. This, as a result, has created an everlasting demand for the careers in Salesforce professional all across the globe. Generally, conclusions are not so one-liner as in the case of Salesforce. Since every business has its customer and management of the customer is very vital for any business to survive and grow. 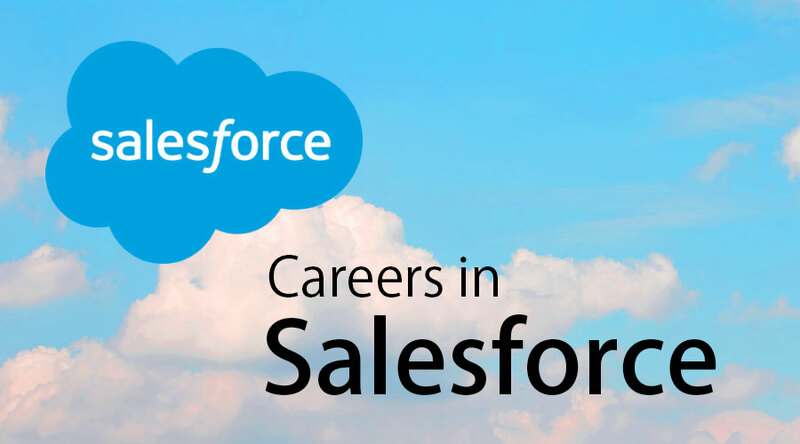 Hence, careers in Salesforce is a very good opportunity for any aspirants who are looking to build their career in a cloud, CRM, development, architect and other skills related to it. Ultimately a good career will lead to better salaries.